Musings of a Menopausal Melon - mmm! 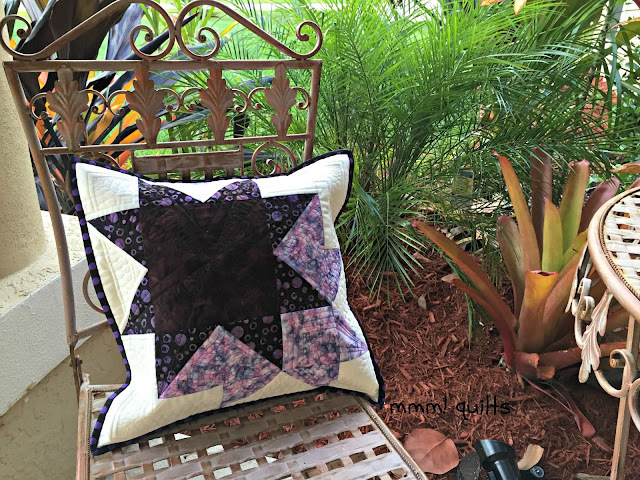 quilts: Shadowed Star Cushion Cover, RSC Quilt #2 and Sunday Stash! Shadowed Star Cushion Cover, RSC Quilt #2 and Sunday Stash! This is on my Q1 FAL list which you can see here. Rather dismal how far from it I have strayed. However, on a positive note, I have this finish to show you! It fits in beautifully with Angela's So Scrappy colour theme for March of purple with a hit/hint/splash of yellow. I saw this on a linky party somewhere, commented to the person whose blog it was on, didn't hear back for several weeks, and in the meantime, I'd drafted the block myself and made this test one. I knew immediately it would grow up to be the graduation quilt for Dayna, who graduated from Wayne State last May. When I did hear back from the girl whose miniature block this was, (it was a leftover from a little quilt, and she was turning it into her guild nametag), she told me what pattern her little quilt was. 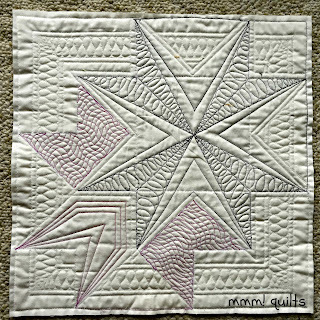 I researched that and that pattern (which looks nothing like my quilt) credited the block as one of Judy Martin's. I've since contacted her to okay using her block, but have not heard back for a couple of months. I assume it will be okay since this other girl made a quilt pattern and is selling it using this block as the basis. Here is the cover on a too-small pillow form. Dayna will take the cover home with her when she comes for Easter, (flat is easier to pack) and I'll get her the 15" pillow form this cover requires once we are back home too. I tried to show the quilting a little better but there was very little sun on Saturday, but lots of thunderstorms! The quilt designs here match those in her big quilt. The dot to dot one is my own design, and the matrix one in the "wings" of the shadow are Leah Day's Matrix. There is a very slight hint of yellow in the polka-dot-esque black and purple batik; can you spot (haha) it? I thought to take a photo of the back of the front (you with me on that?!) before I put the backing on. I don't usually put a muslin backing on the front of a cushion cover; I do like Amanda Jean of Crazy Mom Quilts does and just leave the batting (this is a Warm 'n White scrap) uncovered, since there will be a pillow inside. No clue what I was thinking when I layered this baby, uh, ahem, last summer. The next item is still in the March colour of purple with a little hit of yellow. I seem to have A. started another scrap quilt for the Rainbow Scrap Challenge, which makes two now on the go, and B. I seem to have bought another quilt book. You can see a bit of the book in the top left. I almost moved Bella's spider-baby out of the picture area, and then I realized it's purple! The quilt in the book is all blacks with a pop of red for that 'ring'. I plan to do a row of the colours of each month, in as graduated from darks to lights arrangement as I can within my scraps. 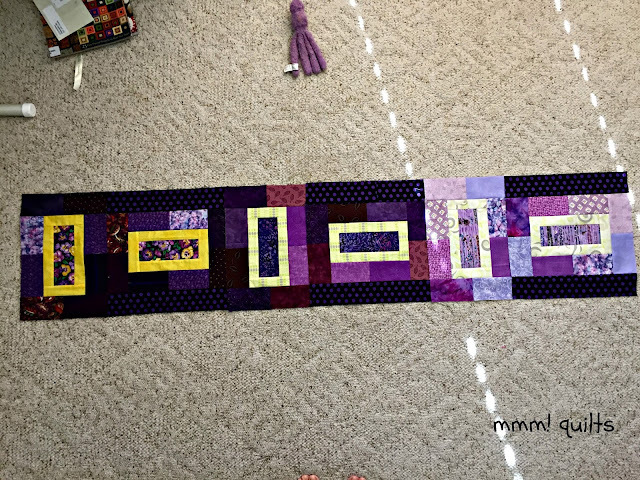 This was especially hard this month, as purple is not so prolific within my scraps, and I only brought smaller scraps with me, so within this row are several pieced pieces(!) to make the required-size rectangle. I'm loving this! 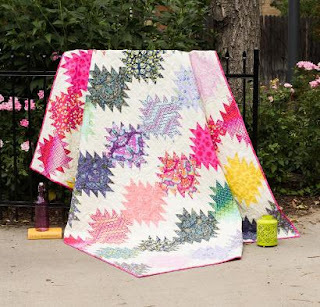 Regarding the quilt book, Cozy Modern Quilts by Kim Schaefer, it's out of the library, but so many quilts have caught my eye in it that I bought it off Amazon used for a few bucks. No affiliation there, but remember you can save $$ by buying used books at a fraction of the suggested retail price. 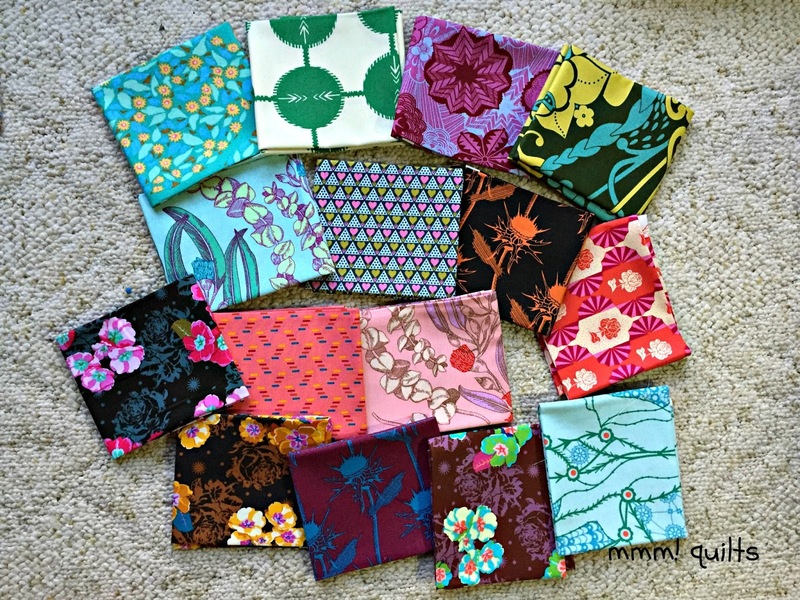 I don't know how, maybe they extended it a day, but this Anna Maria Horner bundle is still what I paid, $27CA, so that is less than $2 per fat quarter, which is AHHH-some! Lick-able prints here, just sayin'...The bundles are $20US for my American friends. I spent some of my Christmas money from my mum this winter on two quilt kits. This is one of them. I haven't checked what other stuff may still be on sale, but I'm going to go out on a limb and say I bet there are several other items. I wouldn't wait; who know when they'll take these off. Clicking the pictures will take you to the item, and if you make a purchase, I receive some moola, as you know, since I am an affiliate. Merci beaucoup. :-) As you can see, the $$ seems to go back to Craftsy!! Love all the purple. And your quilting is definitely kewl! What a great test block. And KEWL again! Yup, gotcha on the linking up thing in Lancashire! Small world! Ummm...I think I heard your credit card scream in pain. ha ha ha ha These are all great fabrics. And sounds like great deals. Your pillow is awesome. I always put a piece of fabric on the back -- whatever is hanging around, usually something I don't love any more. Very interesting scrappy project! Is there a name for the block? Did it come from that (unnamed) book? I like how the block allows for easy use of our monthly accent fabric. Love the quilting on the pillow it is fabulous! Loving all those purples. Love the pillow and the quilting is wonderful (as usual). You are KILLING me with all these stash show-offs!! That cushion cover is beautiful! I love the quilting that you did on it! 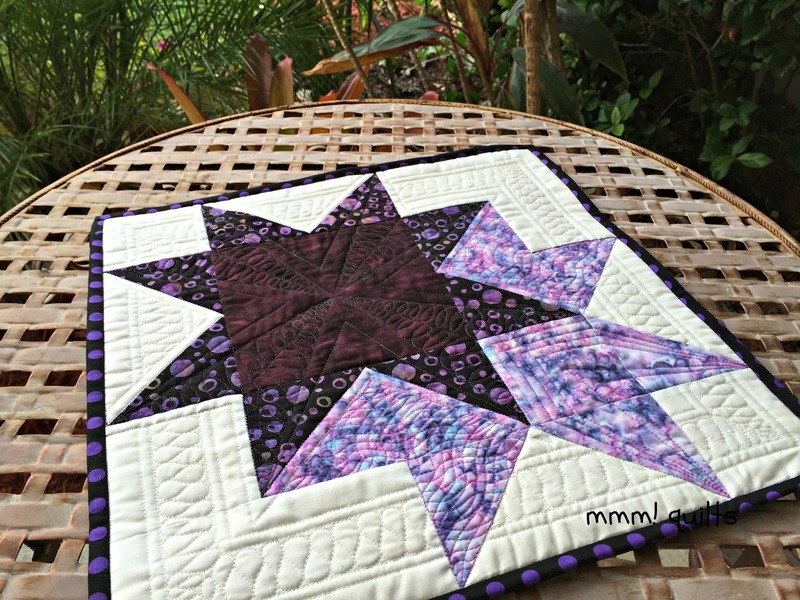 Love, love, love your new purple RSC quilt! That little pop of yellow is amazing! Sorry for the,delay on RSC16. 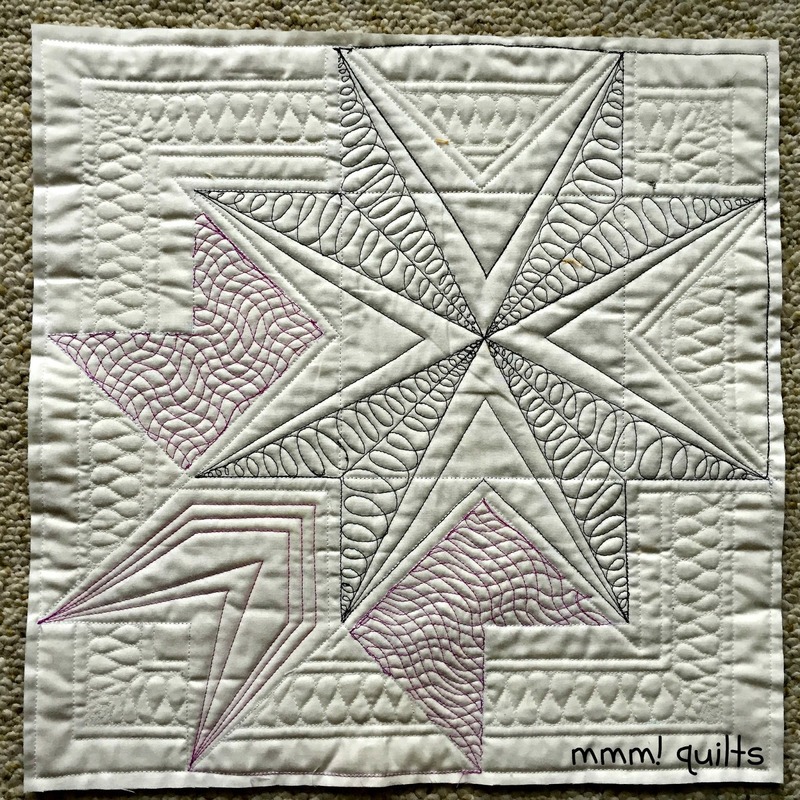 Your star design is very striking and the quilting is gorgeous. Too bad that back is hidden now. Your stash must be loving all the petting. I've already bought a couple of kits for the fabric. Super buy! The pillow is beautiful, I love the design and the quilting. 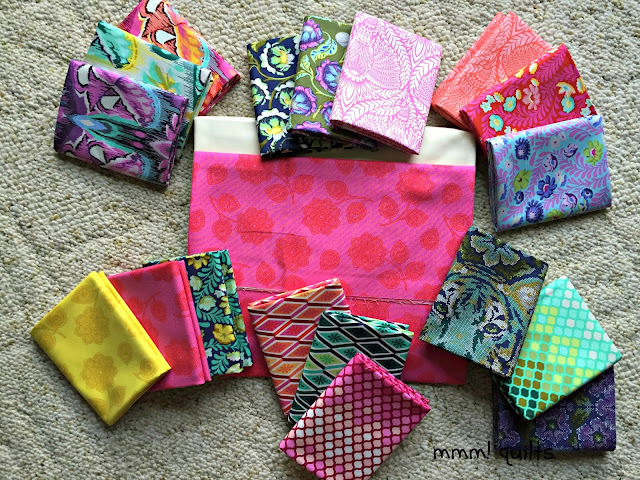 The quilting looks great on your pillow; I love that ribbon candy design. I've been practicing it....I better get back at it! :) Thanks for sharing all your goodies on MCM! 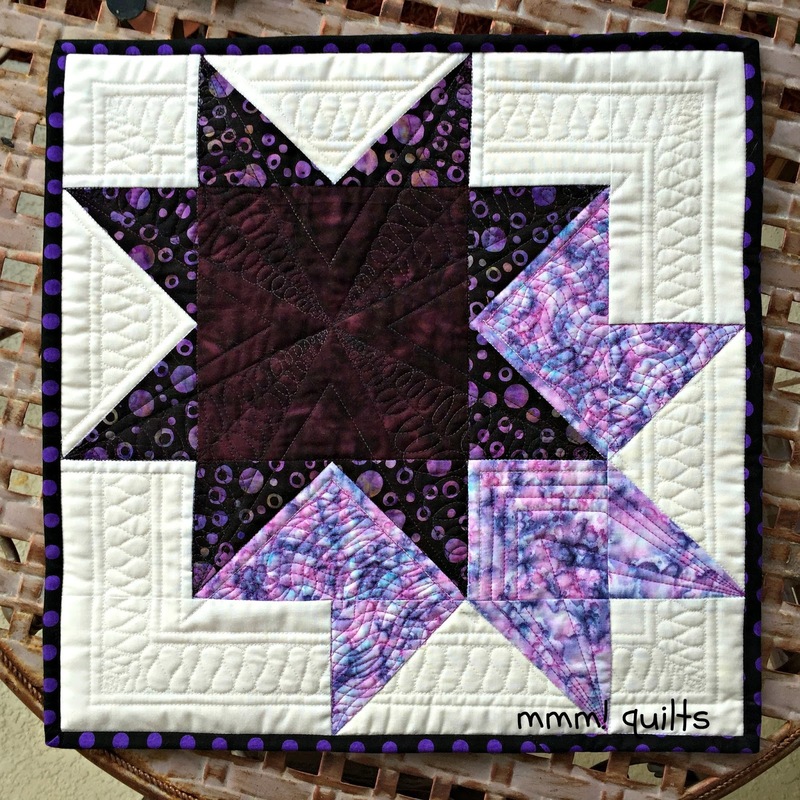 Hey I think I see some toes peaking out in that purple strip quilt photo!! I like what I see of that quilt too! 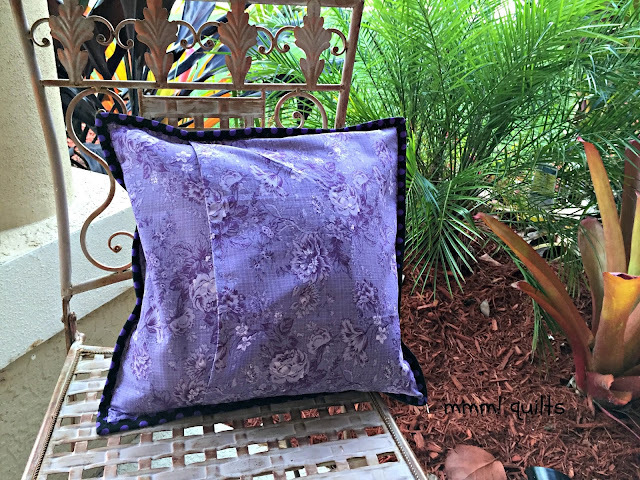 Great cushion cover, love seeing the back of it for the quilting! Nice job as usual my friend!